This list is intended to provide a consolidated reference to a series of posts, messages, and other observations pertaining to dropped calls, call disconnections, poor handoffs and cellular service/feature issues on T-Mobile's Cellular (voice and data) wireless service in the US. Overview: The T-Mobile (TMO) drop list is intended to summarize, on a state by state basis, roads, places and other areas where T-Mobile's voice and data cellular services experiences call drops, disconnections, voice fade-outs, echoing, and other service difficulties. However, as of late 2018, we've noticed a degradation in T-Mobile's voice quality: it doesn't have the "crisp", or "local call" sound as do most AT&T Wireless cellular calls, yet both TMO and ATT use the generally acceptable-sounding GSM digital protocol to transport calls. We're unsure if their is due to T-Mobile using some low-quality, Voice-over-IP type backhaul (the connection from the cellular tower or system to the landline telephone network) or some other unkown problem, but for whatever reason, the clear-sounding GSM calls which we used to enjoy on T-Mobile now sound more muted and muddled, while calls on AT&T remain much more like traditional telephone service and sound much more suitable for normal conversion. Additional details on T-Mobile's voice and sound quality issues can be found on the Cellular Comparison of Carriers page. Additionally, the GSM protocol has a somewhat lower "latency" than CDMA. That is, if a T-Mobile customer were to call a landline, and say "Hello! ", the called party may have a 2/10th's of a second delay from the time "Hello" is uttered on the TMO phone to the time the called party hears the word "Hello" on the landline. Latency in inherrent in both GSM and CDMA digital protocols, as it takes time for the analog (voice) sounds uttered into the cellphone to be converted to digitial signalling (digitized) and the converted back to analog for transmission to the dialed number. While the latency from a single cell phone (GSM or CDMA) to a landline may not be noticeable by some, on cellphone to cellphone calls, or cellphone to Voice-over-IP phone calls (Voip, also digital, suffers some latency as well, which varies based on the given Voip carrier and the data network/internet connection used to carry the Voip call), each additional digital "step" adds more latency, making the delay more noticeable. For a detailed discussion and illustration of cellular and Voice-over-IP latency as compared to traditional landline service, please see the Digital Cellular and Voice Latency page. Generally, T-Mobile's coverage outside of urban/suburban areas or along intercity corridors (I-95, I-78, I-83, I-84, etc.) is somewhat lacking, and T-Mobile's "fallback" roaming on AT&T is often restricted or unavailable, resulting in large areas of "no service" or poor service. As an example, a recent trip (July 2016, and then again in Feb 2019 with no improvement!) on the Sprian Brook and Taconic State Parkways (in lower New York State) resulted in the following drops driving northward: Sprain Brook at Mile Marker 6 (just south of JCT NY-100C), drop on the Taconic in Ossining at JCT NY-134, drop between Bryant Pond Road and Peekskill Hollow Road, drop just south of Miller Hill Road just south of I-84, and a drop just south of JCT NY-82. The first drop is less than 25 miles north of Manhattan and these drops continue northward on one of the most heavily travelled north/south roads to/from New York City, potentially affecting a large number of T-Mobile customers, and yet nothing has apparently been done to correct there obvious and glaring drops! Morever, further north along the Taconic Parkway, at US-44 in Millbrook, NY, about 85 miles north of NY City, there is barely any T-Mobile coverage at all, while Verizon and AT&T do varyingly acceptable jobs, and this paucity of T-Mobile's coverage extends all the way to I-90, just south of Albany. While we can understand that certain rural and hilly areas of Columbia County in the mid-Hudson Valley are perhaps not priorities for a carrier like T-Mobile, the fact that they apparently can't even cover the Taconic Parkway properly, while AT&T and Verizon can, is emblematic of the problems and infirmities with T-Mobile's coverage nationwide, and should put potential T-Mobile customers on notice that they should not expect very good (if any) coverage, even on major corridors, outside of urban areas. The lack of 'drop-free' coverage on such a heavily traveled road serves as an example of some of the failures and frustrations with TMO's less-than-stellar coverage outside of urban areas. Having so many drops occur in a 50 mile stretch of road (one for every 10 miles on average) when other carriers (such as Verizon) don't suffer from a single drop for the entirety of the same segment is a significant failure on TMO's part and the fact that to this date (March 2018) these drops have not been corrected on such a busy highway in the nation's largest SMSA/Metropolitan Area is indicative of T-Mobile's apparent lack on focus and/or concern where it is aware (or should reasonably expected to be aware) of all the aforementioned drops. 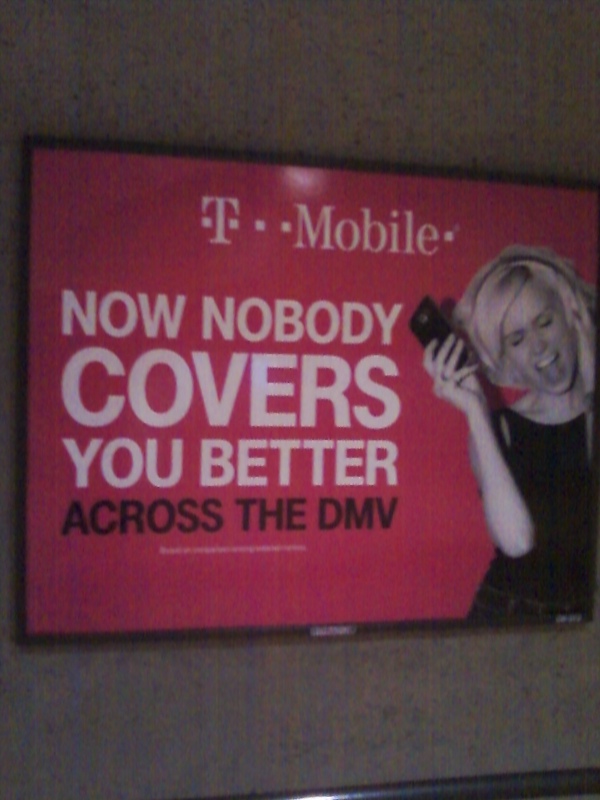 T-Mobile Spring 2016 advertisement in the DC Metrorail system, promoting superior coverage in the DC, Maryland and Virginia (DMV) metro areas. This claim seems dubious - they have probably the worst coverage on Metro at key stations, drops in the District downdown (see the Washington, DC drop section, below), poor coverage in many areas (note the outdoor roof of the Georgetown Safeway (the old "Social Safeway") has pretty much no coverage to speak of), and generally, of all the carriers, seems to have the greatest number of voice and data drops. Who actually performs these tests? The same people who 10 years ago reported that AT&T Wireless had the 'fewest drops', which AT&T Wireless was then forced to retract? TMO has many benefits and advantages, but good coverage, let alone the superior coverage which this poster implies, is certainly not one of them, at least not in DC! 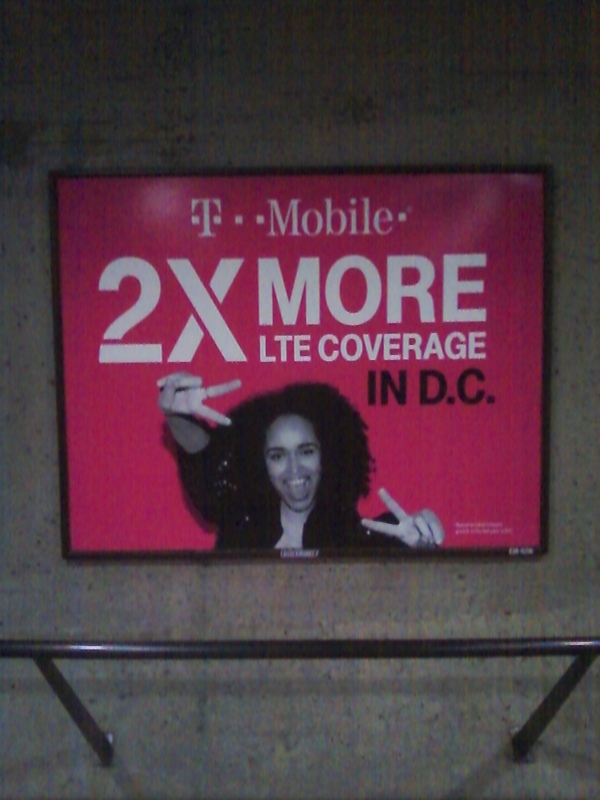 T-Mobile ad from June, 2016 in the DC Metro at the Courthouse (underground) station on the Orange/Silver lines, claiming twice as much LTE coverage in the DC area. Ridiculously, both voice and data calls drop just at this poster/advertisement in the passageway between escalator banks. Sort of a poor show if TMO's coverage drops right when walking by the poster! More generally, we're not sure what metrics they use to come up with this, but in our experience TMO's 4G coverage is rather limited, especially in Metro! In many cases (Rosslyn, Clarendon, Metro Center, Farragut North, Dupont and others) there is barely any T-Mobile data service (see the drop list below), and where there is data coverage, it is most often 2G (or oddly 3G at Bethesda at the north end of the station), but not 4G/LTE, whereas Verizon, which has its own fair share of problems in underground stations, appears to have 4G coverage in nearly all of them. Seems like more hype than fact on the part of T-Mobile. So despite the somewhat superior GSM-based sound quality (AT&T is still better than T-Mobile, Verizon and Sprint slightly worse with CDMA), and attractive International roaming plan, customers who need a reliable cellular provider with few drops and extensive coverage may want to look elsewhere as TMO, currently at least, will unlikely be able to meet these criteria. On a more positive note, during most of our dealings with T-Mobile's customer service, we've been dealt with in a friendly, professional, common-sense manner, and always with US/Canadian call centers. Correction 2/23/2017: This seems to be no longer correct! During a routine call to update a credit card for recurring billing, the call was routed to a call center in the Philippines, where it took 15 minutes to update a credit card (the prior one had already been on recurring billing, so it was just a matter of providing the 'last 4' digits of the new card), and even after 15 minutes the rep was having problems. It was also very difficult to hear her due to the delay/latency of the call. We called back in an asked for US-based call center and the rep there immediately took the update and that was that, in 30 seconds. So it seems that TMO has decided to go the way of Verizon and AT&T (and Sprint?) and farm out some calls to the Philippines, which, for whatever reason, seems to be staffed with much less qualified employees than those based in the States. We make no statement as to why one is better than the other or if it's a good idea to field these calls abroad, but the results speak for themselves, at least in our experiences, so why do carriers still force customers to deal with these time-wasting and oftentimes useless call centers? Generally, though, when it comes to their US-based support, unlike many other mobile carriers, wait times for technical support and billing are generally reasonable, and TMO's IVR/queue system allows for call-backs when a representative is available so callers don't have to wait on hold. Moreover, T-Mobile as of July 2015 began to offer "home" area calling in both Canada and Mexico, as well as free calling to/from/within the US, Canada, and Mexico, essentially making all of North America a single calling market!. Voice calls, text messages, and data rates are the same in Canada and Mexico as they are in the US, with no roaming or other charges within/between the three countries! Even as of Spring 2016, no other US carrier is offering such an attractive and simple plan -- Verizon wants $2 per day for essentially the same plan, and AT&T Wireless has their usual convoluted rate basis where voice is included in your home rate but data is charged separately, or something like that (we're still having a hard time figuring it out! ;) ). So the T-Mobile plan for unified US/Canadian/Mexican service is groundbreaking and one of the reasons why, despite their poor coverage, we use T-Mobile since they make up for their poor coverage by exceptional value and simplicity in other aspects of their service, such as North American pricing. Outside of North America, T-Mobile continues to be on the vanguard of simple and low-cost international mobile service by offering unlimited international data roaming (at slower 2G speeds, though), unlimited international text messaging, and 20 cent per minute calling to/from the US in over 140 countries. As with the North American plan, no other US carrier can match this, although Verizon does offer a $10 per day plan (outside of Canada and Mexico) with full 4G data where available, and data, voice and text messages are charged as per a given US-based customer's home rates are (including unlimited). While Verizon's plan effectively offers free calling to/from the US, making the plan very attractive for customers who need to call back to and/or receive calls from the US on a regular basis, the $10 per day add-on charge is quite high, and in many cases T-Mobile's (free) international roaming plan would be a better value. Sprint also offers a similar plan to T-Mobile, it seems, and as usual, it's hard to decipher exactly what AT&T's plan is and in which countries it would apply. Overall, the T-Mobile Cellular Voice Dropped Call List will hopefully serve as a central source where such drop information may be collected, posted, and utilized in furtherance of future service improvements by T-Mobile. Drops occur over a period of more than a month, e.g., if a drop is experienced on 05/01/2005 it still needs to drop on 06/01/2005 for it to be posted. Ordering Note: Lists are alphabetically organized, first by state and then by counties within states. In some cases, large Metropolitan areas which span a multiple set of counties, states or boundaries are listed as separate entities (such as New York City). Certain subway systems (such as DC Metro) are organized by line and are considered subcategories within the primary city in which they are contained. Please feel free to submit your drop/reset experiences with T-Mobile (TMO) which meet the above guidelines so that we can provide a more comprehensive list. Contact information for this list is provided at the end of this page. Additionally, if you feel that an item is incorrect, please let us know the specifics of your experiences in the given area so we can test it and modify the list accordingly. Fairfield County, Brookfield: T-Mobile calls drop on the "Super-7" US-7 freeway extension/Brookfield Bypass, between the southern junction with US-202 (where the freeway used to end) and the "new" northern terminus at the northern junction and multiplex with US-202. Occasionally calls attenuate so they are inaudbile in the southbound direction south of the old terminus but do not drop until the Federal Road exit. Most recently observed: 09/26/2014. Fairfield County, New Canaan: TMO drops occur on the Meritt Parkway/CT-15 just North (compass east) of the New Canaan rest area, and before the JCT with CT-123. Most recently observed: 10/15/2014. Fairfield County, New Canaan: T-Mobile drops calls on Old Kings Highway, which breaks off of CT-106/New Canaan Rd. heading east towards the New Canaan/Wilton Line, about 1/2 a mile west of the New Canaan/Wilton town line. Likely part of the generally poor T-Mobile coverage in eastern New Canaan (north of the Merritt and east of CT-123) as well as the poor coverage specifically along CT-106 and north, the drops and poor coverage in areas north of the Merritt make T-Mobile generally useless for anyone who lives/drives there. Most recently occurred: 07/07/2018. Fairfield County, Ridgefield: T-Mobile voice calls drop on US-7 at the JCT/intersection with De Haviland Road near the Ridgefield/Redding line. Most recently observed: 07/16/2015. Fairfield County, Ridgefield: T-Mobile drops calls along CT(/NY)-35 / South Salem Rd just east of the NY State line at the JCT with South Salem Rd. Most recently observed: 06/01/2018. Hartford County, Enfield: T-Mobile calls drop along I-91 near exit 47/JCT CT-190 (another one of Connecticuit's unbuilt freeways). Heading southbound, TMO calls begin to attennuate at JCT-220, and drop completely just south of CT-190. Northbound, calls sometimes hold a bit more often, but when the drop, drops occur just north of CT-220. Most recently observed: 10/02/2016. Hartford County, Hartford: T-Mobile calls drop along I-91 just north of the JCT with I-84, around 50% of the time. Calls tend to drop more in the southbound direction, and TMO customers transiting I-91S to I-84W will often experience a drop by the Sisson Ave. exit on I-84. Most recently observed: 10/02/2016. Hartford County, Milldale (Southington): T-Mobile data and voice calls drop slightly west of the JCT of I-84 and I-691, most often when heading in the westbound direction. Calls initiated along I-84 east of the I-84/CT-372 JCT generally drop upon ascending the hill on I-84W towards Chesire/Waterbury. Most recently observed: 02/28/2015. Litchfield County, Kent: T-Mobile call drops occur just west of JCT of US-7 and CT-341, between the Kent School (where coverage is OK) to just before entering the state of New York. (The reverse is ture for calls transiting between NY to CT.) Most recent instance occurred on 04/15/2017. Litchfield County, New Milford/Canaan areas: Spotty to poor coverage on TMoble along US-7 north of New Milford/JCT US-202. Some patches of coverage are available heading north on US-7 between New Milford and Canaan, CT (at JCT US-44), but generally no reliable coverage and calls will frequently drop. This section is typical of the problems with TMO in that they lack the same breadth of coverage which Verizon has in exurban areas, and even when allowed to roam on AT&T Wireless, reliability will be tennuous due to AT&T's generally inferior exburban coverage than that of Verizon Wireless. Last observed: 10/19/2014. Litchfield County, New Milford: Very poor to no T-Mobile coverage at the US-7 Citgo station along the eastern side of US-7 just south of JCT US-202. The relatively ephemeral and transient quality of T-Mobile's coverage in New Milford is typical of much of TMO's service in the area off major highways or outside of the immediate vicinity of large cities, and is evidenced by how poorly TMO covers relatively heavily travelled roads such as US in areas which are not too topographically challenging. Last observed: 09/25/2015. Middlesex County, Durham: T-Mobile calls deteriorate in quality heading north on CT-79 from Madison past the CT-80 rotary. By the time drivers reach the JCT with CT-148, no calls via T-Mobile as possible, and even though AT&T Wireless has some coverage in the area, T-Mobile customers (neither pre-pay nor post-pay) can roam on AT&T in the area. Effectively, between CT-80 and CT-68, there is no coverage on T-Mobile along CT-79/CT-17. Last observed: 03/01/2015. Middlesex County, Haddam: T-Mobile calls drop at or in the vicinity of the JCT of CT-9 and Beaver Meadow Rd (exit 8). Last observed: 01/15/2015. Middlesex County, Higganum: T-Mobile calls drop along CT-9 in the vicinity of Exit 9 / JCT CT-81. Essentially, T-Mobile coverage along CT-9 drops every few miles (if not sooner!) between Middletown and Saybrook/I-95. (See the other entries above and below this one in Middlesex County, CT.), so the drop here is no surprise. Last observed: 03/15/2017. Middlesex County, Middletown: T-Mobile drops occur along CT-9, just south of exit 11/CT-155/Randolph Road, in either direction, generally around the apex of the tall hill south of the exit. This used to be a common drop area for all the carriers, but at least in terms of Verizon the problem was fixed long ago, yet TMobile typically still drops there despite it being a heavily travelled road from central CT to the shoreline. Last observed 03/15/2017. Hartford County, Southington/Milldale: T-Mobile calls drop along I-84 just south of the JCT with I-691, generally 50% of the time. Last observed 01/12/2016. New Haven County, Hamden: TMO calls drop on the Merritt Parkway/CT-15 at the JCT with CT-10. Calls attenuate and obtain a distorted voice quality typical of GSM drops a few moments prior to the drop. Last occurred: 04/20/2016. New Haven County, Meriden: TMO calls frop on the Merritt Parkway (Wilbur Cross)/CT-15 at the JCT with I-691, where CT-15 transitions from the Berlin Turnpike to the Wilbur Cross (Merritt) Parkway under the I-691/I-91 interchange. Last occurred: 04/30/2014. New Haven County, Meriden: T-Mobile calls drop along I-91 in the general vicinity of the southbound rest area, south of JCT CT-68. Additionally, even in the parking lot of the southbound I-91 Meriden rest area there is little to no T-Mobile coverage and data service is so spotty as to be utterly useless. Last observed: 09/16/2015. New Haven County, North Haven: T-Mobile calls drop on the Merritt Pkwy approximately 2 miles south (west in actual direction) on the North Haven Tunnels, 1/2 mile south of the JCT with CT-63/67. Last occurred: 01/12/2015. 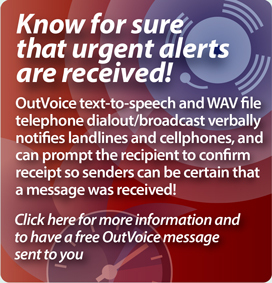 New London County, Stonnington: TMO calls (voice and data) drop along I-95, US-1 and other roads between I-95 and US-1 in the vicinity of the CT/RI border. Along I-95 northbound, T-Mobile calls drop approximately 1/2 mile past the state line into Rhode Island, and southbound along I-95 near the Stonnington Rest Area in CT. Also see the Rhode Island section, below, for drops in the Westerly, RI area, (likely) associated with this drop. Most recently observed: 08/19/2014. Tolland County, West Willington (also Windham County, West Ashford): T-Mobile calls drop (both voice and data) along CT-74, from JCT I-84 in West Willington (Tolland County), heading east by southeast along CT-74 to it's terminus/JCT with US-44 in West Ashford (Windham County). TMO's coverage is generally good up along I-84, but coverage degrades rapdily and varies with the undulating hills which CT-74 traverses (at the top of a given hill where it can "see" towers for I-84 there is good coverage, while in the valleys there is poor coverage and calls drop). Thus, motorists can expect decent T-Mobile coverage up near I-84 in West Willington, but by the time they reach the end of CT-74 in West Ashford, it's unlikely that any call can be maintained, or for that matter that they have much of any T-Mobile service. (As usual, Verizon is fine, and one can drive from Hartford on I-84 to CT-74 to US-44 to CT/RI-101 to US-6 to Providence on Verizon and not have a single drop! Why is this circuitous route significant? Well, for over 50 years the State of Connecticut has needed to replace a dangerous and out-of-date US-6 routing from Hartford to Providence, and as of yet has failed to do so, so drivers, having no good way to get to Providence from Hartford, have been using less safe local routes for years. Apparently, it's easier to let people die and have traffic going through small northeast CT towns than building a road which everyone agrees is needed, but that's another story...). Most recently observed: 11/04/2016. Windham County, Ashford/Warrenville to Pomfret: T-Mobile calls drop (both voice and data service) along US-44, due to pretty much no coverage along US-44 from JCT CT-89 in Warrenville (near the 24-hour Cumberland Farms) all the way east to the JCT with Paine Rd, just east of the Natchaug State Forest's eastern periphery. There is essentially no coverage along this entire stretch of US-44, which, due to Connecticut's inability to build I-384 to Providence (eg, replace US-6), is a heavily travelled road due to a lack of alternatives. Verizon and AT&T customers will experience good service and drop-free coverage along the entire stretch from Warrenville to Pomfret, so why can't T-Mobile manage this? And of course TMO customers can't roam on AT&T Wireless in the area it seems, so hopefully a T-Mobile customer driving along US-44 in the area will make sure to not break down or have an accident or they may be waiting a long while for help! Most Recently observed: 11/04/2016. Windham County, Brooklyn: TMobile drops occur while travelling on US-6 at the apex of a hill located approximately two miles east of the JCT of US-6 and CT-97. Most recent instance occurred on 10/01/2014. Windham County, Pomfret: T-Mobile calls drop along US-44 heading east near the JCT with CT-97, and more precisely at the JCT with Prarie Rd. Likely part of the poor coverage/no coverage area from Pomfret to Ashford (see above). Most recent instance occurred on 07/16/2017. Windham County, West Ashford to Warrenville: T-Mobile has spotty to very little coverage and frequent call drops along US-44 from JCT CT-74 in West Ashford (near the 24-hour Mobile Station) to the JCT with CT-89 in Warrenville. T-Mobile calls drop and data service is useless along this stretch of US-44. Most recently observed: 11/04/2016. New Castle County, Delmarva Peninsula, both DE and MD side: Poor coverage and drops using T-Mobile on many of the local roads between the N/S line which divides DE and MD. E.G., while traveling from US-301 on the MD side eastward to DE, there is generally poor coverage on t-Mobile's Eastern Shore network, and it's uncertain whether or not roaming is permitted there to AT&T Wireless. DE-1 south of the canal experiences periods of signal fade-out near the Delaware Rest Area (along US-13) and south of Dover towards Ocean City (DE-1 to Rehoboth, and then south to Ocean City) numerous drops and fade-outs occur. This section of the Eastern Shore is not topographically challenging so it would seem that the problem is a poorly built-out network (or non-existent one). As indicated in other areas of the list, Verizon coverage is generally flawless there, so it clearly is an area which can be well-covered, it just isn't by TMO. Last observed: 09/07/2014. New Castle County, Neward: T-Mobile calls drop along West Chestnut Hill Road, between DE-896 and Otis Chapel Road (more specifically, drops often occur along West Chestnut between Tall Pines and White Birch drives, but these are very local and hard to find roads). Chestnut Hill Road (along with DE-4 to the north, closer to UDEL) are both heavily used roads to avoid the MD/DE tolls along I-95, and the area is relatively flat and not topographically challenging for cellular coverage/RF propogation, so why T-Mobile drops in the area is lost on us (every other carrier is fine). Last observed: 11/20/2016. New Castle County, Wilmington: T-Mobile calls drop along I-495 near the JCT with DE-3 in Edgmoor. The area is mainly flat along the coastal plain, and not very topographically challenging. No other carrier experiences problems in the area. Last observed: 08/23/2016. DC area T-Mobile data note: As of late June, 2016, we've noticed that on more or less all "nearly 4G" High Speed Packet Access (HSPA) phones, such as the LG C-800 "My Touch" and similar non-LTE models, what used to indicate as "4G" data service is now showing up as only "2G". We suspect that this is due to T-Mobile's likely frequency shortage in the DC area (and many other areas as well), as it converts the 1700/2100 MHz bands to LTE ("true" 4G) only. HSPA (and it's variants, HSDPA and HSUPA; generally referred to as "HSPA" although there are speed and other differences) is an earlier nearly-4G technology which offers download speeds close to true 4G but somewhat slower upload speeds; latency is also a bit slower with HSPA than true 4G. Originally, around 2008 or 2009, T-Mobile ran HSPA on the 1700/2100 MHz bands which it owns/operates on, and later shared the spectrum with LTE ("true" 4G) when LTE was rolled out a few years later in 2014/2015. It appears from TMO's announcements that it is moving HSPA service off of 1700/2100 (which the older phones are designed to use for HSPA), and moving all HSPA service to the "AWS" 1900MHz spectrum, which while many older phones are able to use for voice calls, eg, talking, they are not able to use it for HSPA data access, causing many phones which used to show "4G" to now show only "2G". It is unclear if this frequency re-alignment (or "refarming" as it appears to be called) will eventually be effective in all TMO markets or just those without sufficient LTE 1700/2100 bandwidth to also accommodate the slightly older HSPA data service. Thus, for those customers who purchased a T-Mobile phone (or compatible/unlocked GSM model) from maybe 2012 or earlier, in markets where TMO has moved HSPA to "AWS"/1900 Mhz frequencies, unless your phone is able to handle data on 1900 MHz, it is likely that service will be reverted to 2G only speeds. This seems to be the case throughout the entire DC, Virginia, Maryland (including Baltimore) markets, and possibly into the Philadelphia market as well. Rather than keep a little bit of 1700/2100 MHz spectrum available for HSPA phones which can not use data on 1900 MHz, T-Mobile just effectively blocked all customers with phones more than a few years old from using 4G data! 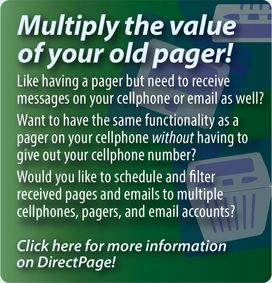 See the Cellular Carrier Comparison page for more details. Baltimore County, Baltimore, Baltimore (train) Tunnel: North of Baltimore Amtrak/MARC trains go through a tunnel; calls regularly drop there. (Note: in 2010, AT&T Wireless and Verizon were tried there as well, and both dropped. In 2014, TMO was tried there as per this line item, but VZW and ATT were not tried. It is unknown at this point if VZW and ATT have implemented coverage in the Baltimore rail tunnel, but clearly TMO as of this writing has not). Last observed: 08/29/2014. Baltimore County, Avalon/Relay/Ellicott City: T-Mobile calls drop and suffer from very poor coverge along River Rd. on the south side and Geln Artney Rd. on the north side of the Patapsco River in the Patapsco Valley State Park. Essentially, there is little to no coverage from Relay (where the Thomas Viaduct of the B&O Railroad heads south to DC and the old main line to Point of Rocks - one of the oldest rail lines still in service in America, splits off along the Patapsco River to Ellicott City, up to I-70, and then westward) to the western edge of the park heading towards Ellicott City along a spearate section of River Road which follows the Patapsco River westwards. Interestingly, the park lies directly under I-95, and within a mile of I-195 and I-895, all of which have acdeptable coverage with all major carriers. Why the park itself is not covered (the lower elevation perhaps?) is unclear, but no carrier has acceptable level of coverage in the park, and coverage only gets better heading west along River road at the JCT with Thistle Rd. (which connects River Rd with MD-144/Frederick Rd. at a higher elevation). Last observed: 05/18/2017. Baltimore County, Hereford: T-Mobile calls drop along I-83 in the vicinity of Mile Marker 25. There is practically no coverage for aobut a mile in either direction (north or south), which is typical of T-Mobile and how even on heavily traveled roads they are unable to maintain a continuous connection or offer through coverage as evidenced by this dead spot. Last observed: 09/01/2015. Baltimore County, Towson: T-Mobile has poor data service and data sessions often drop along I-695/Baltimore Beltway between MD-45/York Road and MD-145/Dulaney Valley Rd. Last observed: 06/06/2017. Baltimore County, Towson: Perhaps related to the above, T-Mobile calls drop along the Baltimore Beltway/I-695 at the JCT with N. Charles St/MD-139. Last observed: 08/16/2017. Cecil County, Conowingo Dam: T-Mobile calls drop within 1 mile Northbound or Southbound along US-1 (which crosses over the dam); NB calls drop near the JCT with US-222, and southbound calls drop near the JCT MD-161. Although a semi-rural area, US-1 is the only free crossing of the Susquehanna River in the area (both I-95 and US-40 are tolled in the northbound direction), and as a result of having to pay off for the ICC/MD-200 project (which would not have been tolled and would have had a more useful alignment if it were built in the 1980's/90's as a free road but for the usual (and costly) "build absolutely nothing" local opposition), an increasing number of drivers use the dam as a more cost-effective alternative. Thus, TMO should consider improving its coverage in the area along US-1 north of Port Deposit/Havre de Grace to facilitate the increasing number of drivers fed up with MDDOTs ever increasing tolls. Last observed: 04/12/2016. Cecil County, Rising Sun: T-Mobile calls drop along US-1 at the MD/PA border, and heading northward after entering PA, there is poor TMO coverage for about a mile or so into Pennsylvania, resulting in generally poor T-Mobile coverage proximate to the MD/PA border. Last observed: 05/25/2018. Frederick County, Myersville: I-70 Rest area - Poor coverage for both voice and data calls; voice calls drop regularly when walking around the grounds of the rest area and inside the guest area building. There is no roaming on ATT Wireless, although it is unlikely that even with ATTWS roaming in the area that it would make service any better, as ATT Wireless' service there is very poor as well. (Only Verizon has acceptable levels of coverage there.). Data is similarly poor and unreliable, and suffers from many dead spots and areas where the minimal 2G coverage is insufficient for any data applications of any kind. Last observed: 05/05/2015. Harford County, Aberdeen: T-Mobile calls (voice and data) drop on I-95, more in the northbound than southbound direction, just north of the JCT with MD-22, passing Cal Ripken Stadium (Orioles Minor League team stadium). Last observed: 08/16/2017. Harford County, Havre de Grace: TMobile calls drop when driving on MD-155, north of JCY I-95, prior to the JCT of MD-161/Dalington Rd. TMobile calls initiaited on I-95 or on MD-155 which proceed north towards Have de Grace will usually begin to attenuate near MD-462/Paradise Rd, and by the time MD-161 is reached calls drop entirely. Although a smaller road, it is frequently traveled by motorists who wish to avoid the outrageous MDOT tolls on the I-95 and US-40 Susquehanna River crossings (US-1 at the Conowingo Dam is free; see the above Conowingo Dam listing as to why the tolls are so high at Havre on both I-95 and US-40). Most recent instance occurred on 05/16/2016. Montgomery County, Bethesda: T-Mobile calls drop at the JCT of Mass Ave/MD-396 and Goldsboro Rd/MD-614. Most recent instance occurred on 05/20/2017. Montgomery County, Gaithersburg: T-Mobile calls drop between Fields Rd. off of I-370/San Eig Highway and Copley Place at the Crown Park Development. Copley doesn't intersect with Fields (it stops just south of it), but when driving on Fields, on the way to the Harris Teeter supermarket, calls will drop near Copley. Coverage on T-Mobile is also very poor in the area in general, with barely any coverage in many of the shops and restaurants at Crown Park. Most recent instance occurred on 07/27/2017. Washington County, Clear Spring/Hagerstown: T-Mobile calls drop along MD-68/Clear Spring Rd., along the short hill between US-40 to the north and I-70 to the south. Calls initiated, for example, along US-40, will drop after heading south on MD-608 for the 1/2 mile (or less?) drive down to I-70. Another silly drop in an area poorly covered by TMO! Last observed: 05/18/2017. Washington County, Halfway/Hagerstown: T-Mobile data calls drop along I-70 between the US-11 overpass (there is no transition betweenI-70 and US-11; motorists need to use I-81 north to Halfway Rd east to US-11, or I-81 south to a direct JCT with US-11 as the next exit immediately south of the I-70 JCT) and the JCT with I-81. It appears that this is approximately where the demarcation lies between where TMO still provides HSPA (4G-ish) service on 1700/2100 MHz in Hagerstown and the DC/MD/Eastern PA/South Jersey market to the east where 4G is offered via LTE only on 1700/2100 MHz, which may explain the data drop. Last observed: 05/18/2017. Washington County, Hagerstown/(State Line, Pennsylvania): T-Mobile calls drop within one mile of the MD/PA line along I-81. Northnbound, T-Mobile calls initiated in Hagerstown will drop around the PA Rest Area, and southbound, calls initiated north of the last exit in PA/JCT US-11 near the Sheetz gas station on US-11/Molly Pitcher Highway (a mile north of the rest area on the other side) will drop passing the Hagerstown Regional Airport on the MD side of the line. Last observed: 05/18/2017. Berkshire County, Lee/Lenox Town Line: T-Mobile drops calls along US-20 at Mile Marker 16.5 at the "western" line between Lee and Lenox (there is also a drop at the southern line between Lee and Lenox along US-7, see below). T-Mobile has typically poor non-urban coverage in Western Mass, and Berkshire County, even only a few miles away from the Masspike, is no exception. It is likely that there are few major roads which can be driven in Western Mass which T-Mobile will not suffer many drops with, while other carriers (such as VZW and ATT) suffer little (ATTWS) to no (VZW) drops on most major roads in the area. Last observed: 10/05/2017. Berkshire County, Lee/Lenox Town Line: T-Mobile calls drop along US-7 at the "southern" town line between Lee and Lenox along US-7, just south of where it merges with US-20 on it's way north to Pittsfield. Last observed: 10/05/2017. Berkshire County, West Becket: T-Mobile calls drop along the Masspike/I-90 at Mile Marker 23.6 near West Becket. As with the Blandford drop to the east, coverage appears to be generally good on both "sides" of the drop, and it is unlcear (other than TMOs generally sloppy non-urban coverage and lack of attention to coverage "details" like drops) why calls drop in the area. Last observed: 09/28/2016. Berkshire County, Williamstown: T-Mobile calls drop along US-7, just south of the Williamstown Line, at Mile Marker 44.9. Calls initiated in Lanesborough (near where US-7 passes a lake to the west) for example, will continue northwards along US-7 until MM43.5, at which point they will drop, and there is little to no coverage on TMobile from that point north to Williams College. (T-Mobile typically has very poor coverage in the area in general - along MA-2/Mohawk Trail there is barely any coverage from the North Adams hairpin turn west along MA-2 to Williamstown!). Last observed: 08/30/2018. Franklin County, Greenfield: T-Mobile drops calls along I-91, at Mile Marker 48, just south of exit 28A/B (JCT MA-10). If a call is re-established after this drop, about 3 miles up the road, it drops again at the second Greenfield drop (below), and then a third time in VT before coverage is lost completely. (Well, this IS T-Mobile, no one seriously expects them to actual -cover- these areas, right? :) ). Last observed 05/18/2018. Hampden County, Blandford: T-Mobile calls drop along the Masspike/I-90 at Mile Marker 33.2, near Blandford (and just east of the Blanford Service Area). There is generally good coverage on both "sides" of the drop, but for whatever reason, TMO calls just suddently drop in the area of MM 33.2. Last observed: 09/28/2016. Hampden County, Holyoke: T-Mobile drops calls along I-91 in Holyoke, at Exit 16/Hadley/US-202, traveling in both directions (north and southbound). Last observed: 10/02/2016. Norfolk County, Boston: No T-Mobile service in the (underground) Artery/I-93 tunnel or the myriad of approaches and ramps, including the underground transitions to the Tobin Bridge and Ted Williams Tunnel. (In fairness, Verizon has spotty coverage, and AT&T Wireless and Sprint have barely anything.) Last observed: 09/07/2014. Norfolk County, Wellesley (Hills): T-Mobile calls drop on MA-9 just west of MA-128/I-95 at mile marker 124.9. This is a problem area for most carriers; AT&T Wireless (and before it Cell One/Boston) suffers(ed) drops there as well. This is one of the few drops which TMO has along MA-9; heading west from this drop calls hold well past Natick to at least the JCT with US-20, so it seems odd that the area with the most traffic/closest to MA-128 would be where the (apparently) only drop occurs. Last observed: 07/04/2015. Insufficient testing to determine drops. Burlington County, Bordentown: T-Mobile calls (voice and data) drop on I-295, at Exit 57/JCT US-130. Possibly related to the Hedding T-Mobile drop (below), although if calls are redialed immediately after the Hedding / Mile Marker 55 drop, they will again drop two miles to the north, at Mile Marker/Exit 57 just north of the interchange. (A similar drop is also evident at times along US-130 passing under I-295 in the same location.) Last observed: 08/10/2018. Burlington County, Burlington Township: T-Mobile drops calls along I-295 at Exit 47 / JCT CTY-541 Mt. Holly Road. Calls drop in both directions (northbound or southbound) along I-295 within one mile of CTY-541 overpass. Last observed: 01/06/2019. Burlington County, Florence Township: T-Mobile calls drop on I-295 just east of Florence, and just south of Exit 52 / Florence-Columbus Rd. CTY-656. TMO has generally poor coverage along I-295 in central Burlington County, and these drops iterated here are typical of the poor coverage in the area. Last observed: 01/04/2017. Burlington County, Hedding (Mansfield Township): T-Mobile data calls disconnect, and to a lesser extent voice calls drop, along I-295 at or about Mile Marker 55, as I-295 crosses over (but has no interchange with) Old York Road/CTY-660. This is just slightly south of the Northbound only exit/Southbound only entrance to/from Rising Sun Road, which for years prior to the much belated completion of the final segment of I-295 (between US-130, the next exit to the north, and I-195, ie, the segment crossing over Crosswicks Creek, which no doubt some environmental lawyer made a bundle on delaying and delaying completion since it endagered some rare species of mosquito or some other unwanted pest) was the primary way to continue north on (or not, actually) I-295 to the New Jersey Turnpike via Rising Sun Road to Old York Road to US-206 to the NJTP. Fortunately, I-295 was completed in the 1990s (as was NJ-29, the westward extension of I-195 through Trenton to I-95 at Scudder's Falls, which the Delware River Bridge Authority, in transparent desparation, wants to "repair" and, of course, to pay for these "repairs", add huge tolls to! ), and most carriers quickly managed to cover the now closed "gap", but even in 2016 T-Mobile appears to lag behind and has problems there. Data drops more regularly than voice, but both atennuate there and suffer fequent (but not universal) drops. Last observed: 03/07/2016. Camden County, Bellmawr: T-Mobile calls drop on I-295 at Mile Marker 23.4, perhaps related to the above drop at Exit 25. Last observed: 01/06/2019. Camden County, Bellmawr: T-Mobile calls drop on I-295 at Exit 21. T-Mobile's coverage is basically useless along I-295 from the JCT with US-130 all the way to JCT I-76 (and even north of there TMO drops every few miles), and every few miles within this 40 mile stretch of I-295 T-Mobile drops. Last observed: 01/06/2019. Gloucester County, Logan Township: T-Mobile calls drop mid-span on the Commodore Barry Bridge (US-322), on the "NJ side" when heading east from Pennsylvania, and on the "Pennsylvania side" when heading west from NJ. (Technically speaking, the drop is always on the New Jersey side of the river, as the midspan of the bridge is on the New Jersey side.) Verizon and Sprint have no problem holding this call (Verizon can hold a call from Richmond to Boston on this route), yet T-Mobile can't apparently manage to do so. Additionally, there is weak/poor TMO data coverage on the NJ side at US-322's JCT with US-130. Last observed: 05/25/2018. Mercer County, Blawenburg: T-Mobile drops calls in the general vicinity of the JCT of CTY-518/Georgetown-Franklin Turnpike and CTY-601/Great Road. Driving west from US-206 on CTY-518, calls attennuate prior to the JCT with CTY-601, and continuing west, calls drop before entering Hopewell (near the West Trenton railroad line). Heading south along CTY-601, calls attennuate approaching the JCT with CTY-518, and drop just north of the JCT with Cherry Valley Rd. In general, T-Mobile's coverage to the northwest of downtown Princeton is lacking, and is reflected in the poor coverage in Blawenburg and the above roads. Last observed: 05/16/2016. Mercer County, Pennington: T-Mobile drops calls on NJ-31 at the southern junction with CTY-612/Marshall Corner-Woodsville Rd. (CTY-612 meets NJ-31 further north as well; the TMO drop described here is at the southern point where CTY-612 intersects with NJ-31, just north on JCT CTY-654/Pennington-Hopewell Rd., where the (non-gas) Quick Check and Delta Gas station is located). Last observed: 06/05/2017. Mercer County, Pennington: T-Mobile calls drop on NJ-31 at or near Mile Marker 11, approximately 2 miles north of Pennington, as NJ-31 passes under the West Trenton rail line's "quary siding" which crosses over NJ-31 in the general area where the drop occurs. Last observed: 03/02/2017. Mercer County, Princeton: T-Mobile drops calls along I-295 northbound, in the general area of Exit 67A/B JCT US-1. Calls initiated heading northwards on I-295 will drop at or just north of the transition from I-295N to US-1N, just south of the Quaker Bridge Mall, or even sooner, eg, while on the transition ramp from I-295N to US-1N. Last observed: 09/21/2018. Mercer County, Princeton: T-Mobile calls drop along Cherry Valley Rd. at the JCT with Great Rd. Calls also drop northwards along Great Rd between Cherry Valley and Pennington Rd. Generally, T-Mobile has weak/poor coverage in an are delimited by US-1 to the east andNJ-31 (and likely NJ-29 along the river) to the west in the Princeton area. Last observed: 06/05/2017. Mercer County, Trenton: T-Mobile calls drop along I-295, traveling over the Scudders Falls Bridge (between NJ and PA; currently free, but the Del. River Bridge Commission wants to tear it down so they can put up a new bridge with a high toll, even though the I-95 connection to the NJTP will take a lot of the traffic away. Cealry, it's just to get the toll money...). Last observed: 10/27/2014. Middlesex County, Cranbury Township: T-Mobile calls drop on US-130 at the JCT with Old Trenton Road (CTY-685; further west CTY-535), approximately 3 miles north of the JCT with NJ-133/Hightstown Bypass. Verizon, Sprint and AT&T don't drop here (although Verizon used to as it is near the handoff between the Philly/B/00008 and NYC/B/00022 systems, but they managed to "fix" the issue many years ago; for some reason TMO still has problems in the area and don't seem able to fix it). Last observed: 02/06/2016. Middlesex County, Cranbury Township: T-Mobile calls drop along US-130 at the JCT with Broadway Rd., just south of the JCT with NJ-32. Part of a series of drops along US-130 between I-195 and US-1. Last observed: 01/04/2017. Middlesex County, Perth Amboy: T-Mobile calls drop along NJ-440 near the western embankment of the Outerbridge Crossing (a ridiculously narrow bridge which was supposed to be twinned decades ago and is rather unsafe with all the trucks taking up two lanes, but well, when you have a insulated monopoly on transport which charges whatever it wants for tolls why both add any capacity when there are no alternatives anyhow? Typical toll authority mentality of the PANYNJ...). Driving eastwards ("northwards" in terms of NJ/NJ-440's orientation), calls deteriorate and rapidly drop approaching the western landing of the bridge. Drops occur maybe 50% of the time in the eastbound direction. Last observed: 01/04/2017. Morris County, Chester: T-Mobile drops calls along US-206 north of Chester, NJ at the JCT of US-206 and Four Bridges/Hillside Road. All other carriers, traveling north or southbound along US-206, experience no drops there. Last observed: 04/20/2016. Morris County, Newgoundland: T-Mobile calls drop along NJ-23 between JCT CTY-513/Union Valley Rd. and JCT Echo Lake Road (heading up to Ringwood, another area of poor TMO coverage near the lakes) at/near Mile Marker 31. Last observed: 09/05/2017. Sussex County, Franklin: T-Mobile drops calls along NJ-94 near MM30 at the JCT with CTY-631/N. Chruch Rd. (which runs between NJ-23 to the east and NJ-94 to the west, along an old (NY, Susquehanna & Western?) railroad line). Calls on T-Mobile in the generally area are typically spotty, and a number of drop-outs occur in this area of Sussex County; the full drop along NJ-94 at MM30 is one of a few along NJ-94 between the JCT of NJ-94 and NJ-23 in Hamburg and the JCT with NJ-94 and NJ-15 in Lafayette Township. Last observed: 09/04/2017. Sussex County, Sparta/(Morris County, Jefferson Township): T-Mobile calls drop on NJ-15 along the the newer (1974-completed) Sparta bypass segment, and the second northbound JCT with NJ-181. NJ-181, the "old" NJ-15 which runs through Sparta, paralleling NJ-15 slightly to the west, from Jefferson Township north to Sparta, has a few "southern" connections with NJ-181, and the T-Mobile drop occurs at the second northbound JCT, eg, Blue Heron Rd. (NJ-181 initially breaks away from NJ-15 in Lake Hopatcong, and the drop occurs at the next connection northwards from there to NJ-15, which Blue Heron Rd.) Last observed: 09/08/2017. Warren County, Knowlton Township: T-Mobile calls drop along I-80 in Knolwton Township, at Mile Marker 8.4. While there are no exits for nearly 4 miles in either direction, on the eastbound side there is a rest/NJ Welcome area close to the drop (on the uphill side), and the nearest overpass (but not JCT/interchange/exit) is for Cook Rd. Last observed: 09/08/2017. Warren County, Hope Township, Mt. Hermin: T-Mobile calls drop along I-80, around Mile Marker 7.5 (associated the the above Knowlton drop? ), crossing over the overpass (but not interchange/JCT) with "Shades of Death Rd" (yes, that's what it's apparently called - Google Maps seems to confirm it!). Last observed: 02/17/2018. Really? 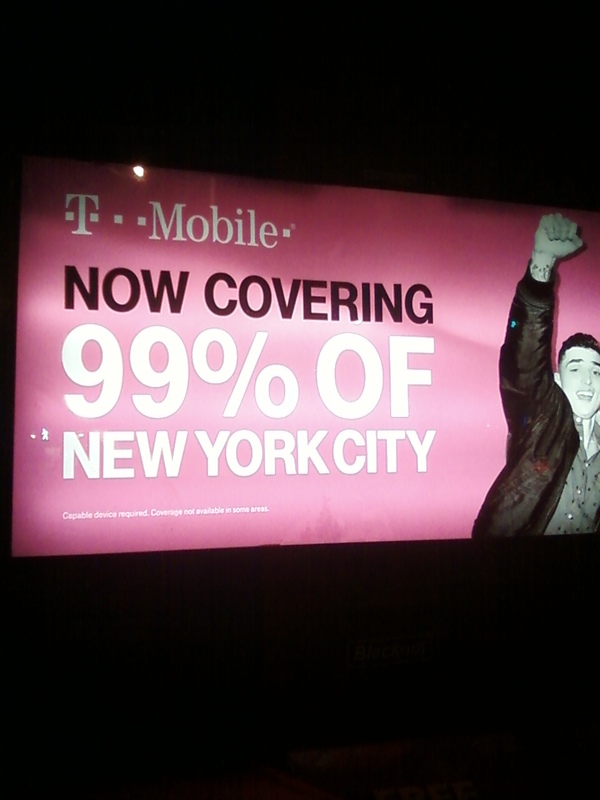 T-Mobile really thinks it covers 99% of New York City? Well, we must always find ourselves in the unlucky 1% which T-Mobile does not cover, but it often seems like a lot more than just 1 percent! A recent example: See the Williamsburg, Brookyln section below. On June 12th, 2016, there was no coverage at all -outside- of a popular restaurant (Mogadar) on Wythe Ave between North 7th and North 8th street, and the poor coverage continues to both ends of the block. (Exactly a year later, on June 12th, 2017, the issue still had not been remedied, and even outside the Whole Foods on Bedford, T-Mobile's coverage - especially for data, is quite lacking.) Williamsburg is a very popular section of western Brooklyn, and deserves better coverage than what T-Mobile appears to offer there, so we wonder if this area (and the generally poor coverage and drops in the general area noted below) alone doesn't put them over the 1% which they don't cover?? Bronx County: TMO drops occur at the JCT of the Henry Hudson (Saw Mill River) Parkway/NY-9A and the Mosholu Parkway/Deegan Connector. Drops occur in both directions, north and south on NY-9A, in all cases within half of a mile of the JCT with the Mosholu Parkway. Most recent instance occurred on 12/24/2014. Bronx County: T-Mobile calls drop approximately 50% of the time at the Weschester County/Bronx County line on I-87/Major Deegan Expressway, in both directions. Initially observed: 06/26/2016. Bronx County: T-Mobile drops calls on I-87/Major Deegan southbound 500ft south of the on-ramp from the Mosholu Parkway. The entire upper segment (north of I-95/Alexander Hamilton Bridge) is plauged by audio drop-outs and data session disconnections, typical of AT&T/Verizon's coverage 15 years ago (when they were Metro One and Bell Atlantic Mobile, respectively), and even Sprint has significantly better coverage along I-87/Deegan Expressway than TMO does. Typical for T-Mobile, the main Interstate heading north of New York City as of early 2017 still has drops and call-quality issues when everyone else seems to have been able to address such problems on their respective networks. Initially observed 05/20/2015, most recent instance occurred on 02/20/2017. Kings County (Brookyln) - Williamsburg: T-Mobile drops calls (voice and data) and experiences connection difficulties in the Williamsburg, Brooklyn area, generally west of Bedford Street (the main north/south street), from North 10th to South 2nd. All other carriers (ATT, Sprint, Verizon) suffer similar issues to a greater or lesser extent, and it's suspected that the problem stems from interference with signals from tall buildings immediately across the East River in Manhattan (similar to some issues in Battery Park City (Manhattan) along the Hudson River Promenade, where signals from Jersey City/Hoboken appear to compete with signals from the Manhattan-side, affecting voice and data performance). Essentially, when one is west of Bedford Street, data calls take a long time to set up and have slow throughput, text messages are slow to arrive, and voice calls are slow to set up outgoing and often miss incoming. It doesn't appear to be a signal stregnth issue (phones show ample signal stregnth), but more that a given phone or mobile device can't lock on a signal/channel reliably. A year later, in June 2017, TMO has apparently not been able to remedy its coverage deficiencies in northern Williamsburg (north of the Williamsburg Bridge), and tests along Bedford, at the Whole Foods, and further east towards I-278/Brooklyn-Queens Expressway, indicate voice and data drops on Roebling (N/S) and 10th (E/W). Most recent instance occurred on 06/14/2017. Kings County (Brooklyn): T-Mobile drops calls along the Belt Parkway in the general vicinity of the Mill Basin Drawbridge, more often in the eastbound direction. Most recent instance occurred on 11/18/2015. New York County (Manhattan): T-Mobile's data service drops connections on the Harlem River Drive (FDR continuation north of the Triboro Bridge interchange) near the old Polo Grounds/155th street. Heading south from the George Washington Bridge, a data connection (such as SSH, Telnet, FTP, or streaming audio/video) will drop heading southwards between 155th and 135th streets, and will need to be re-established. Most recent instance occurred on: 01/03/2015. New York County (Manhattan): TMO drops occur while passing through the East River tubes which are utilized by Amtrak and the LIRR to access Penn Station. Effectively, other than near Penn Station, there is no coverage in the tubes. (Verizon covers them just fine by way of comnparison.) Most recent instance occurred on 11/21/2014. New York County (Manhattan): T-Mobile calls drop (due to no coverage) in the Midtown Tunnel/I-495. Calls drop when entering the tunnel on either the Mahattan (eastbound) or Queens (westbound) side, and no coverage is available until emerging from the other side. (Verizon has no problem covering the tunnel, so as usual one wonders why TMO can't manage this on one of the most heavily traveled Interstates in the country.) Most recent instace observed on 03/20/2016. New York County (Manhattan): TMO drops occur on E57th St. between 1st. Ave and 2nd Ave near the outbound upper roadway ramp to the Queensboro Bridge. Most recent instance occurred on 02/15/2017. New York County (Manhattan): T-Mobile disconnects/drops calls traveling north along 6th Avenue just south of 57th Street, more often data than voice, but both have experienced drops. On a number of occassions, data sessions (and to a lesser exten voice calls) which were initiated south of 14th and 6th and which continue up 6th will drop just south of 57th St. Most recent instance observed on 5/3/2016. New York County, Manhattan: While not a drop per se, unlike other competing carriers, T-Mobile has no coverage in the Whole Foods/Columbus Circle which is underground under in the Time Warner Center. TMO generally markets itself as a carrier for urban locations (as it has such poor coverage elsewhere it could hardly market itself otherwise! ), yet in one of the more popular food shopping venues in NYC it lacks any coverage as compared to its competitors. Most recent instance occurred on 09/28/2015. New York County (Manhattan): T-Mobile data sessions drop along the Henry Hudson Parkway (West Side Highway)/NY-9A at 164th St. Data calls will suddenly drop and need to be re-established. Most recent instance occurred on 04/11/2015. New York County (Manhattan): T-Mobile calls drop (voice and data) in the area of the George Washington Bridge bus terminal, the local Washington Heights access ramps to the GWB, Fort Washington Avenue, and 178th Street in Manhattan. T-Mobile voice calls can degrade when moving in the area, for example, driving southwards on Ft. Washington Ave. from 190th towards 178th/GWB Bus Terminal and the GWB access ramp westbound (to get on the bridge), TMO calls will generally drop at the bus termina; both voice calls and data sessions will drop, even during non-rush hour periods and during overnight hours when circuit congestion shouldn't be a prorlbem. T-Mobile calls will also (less regularly) drop on I-95 approaching the GWB "under the apartments" (a series of public housing(?) apartment buildings built over the I-95 right of way/GWB approach when the lower level to the GWB was built and the tunnels under the Bronx (which are still there, but unused) were bypassed in favor of the wider open-cut in use today). Most recent instance (along Ft. Washington Ave( occurred on 06/06/2016. New York County (Manhattan): TMO calls (voice) and data sessions drop along NY-9A/West Side Highway at approximately 62nd st, more often in the nortbound direction than southbound. Most recent instance occurred on 11/14/2015. New York County (Manhattan): T-Mobile drops calls while traveling through the Battery Park Underpass; calls will drop shortly after entering from either direction and motorists have no coverage until they exit at the other end. Most recent instance occurred on 12/14/2018. New York County (Manhattan): T-Mobile drops calls midspan on the Upper Level of the Queensboro Bridge (more often outbound than inbound). At times, the drop can begin to atennuate at midspan and will not fully drop until crossing under the 7IRT tracks along the upper level access ramps. Last observed: 04/20/2016. Queens County, Forest Hills/Rego Park: T-Mobile calls drop (voice and data) on the Long Island Railroad just west of the Forest Hills station near "Whitepot Junction", where the old, unused Rockaway Branch connected to the main line. (The Rockaway Branch was abandoned in the early 1960's and even though it is still in place and can provide a one-seat ride to JFK to Penn Station (and Flatbush Terminal), as well as a much faster subway connection to the Rockaways, the typical parochial politics of NYC and the various transit agencies prevent an existing and thus relatively inexpensive facility to be utilized, making NYC one of the few major cities without direct airport access. And of course the locals along the tracks to like their "expanded" backyards have suddenly become fervent bicyclists and will do whatever it takes to ensure that a bike path is built there, or a walking path, or a "nature preserve", ie, anything but a train line again due, of course, to their deep, heartfelt convictions for cycling and walking and exercise, and in not way related to their pecuniary gain of using the LIRR right of way as an extended backyard...Why should the benefit of hundreds of thousands of riders impinge upon their quiet enjoyment of property they have errr..."annexed"?). This section of the LIRR is along the main line to Penn Station, yet typically TMO seems to have done nothing to remedy this drop. Perhaps by the time common sense prevails in NYC politics and transport policy TMO will get their act together and fix this drop...this should be around the same time that the 2nd Ave line is connected to the Transit Museum station (as was planned in the early 1930's) and the 7IRT is extended to NJ and/or along 34th Street... In other words, in all likelihood, by the time anyone reading this is long dead...! Last observed: 01/28/2016. Richmond County (Staten Island): T-Mobile drops calls along NY-440, more often heading north, just north of the JCT of NY-440 with the Richmond Parkway (eg, the road which WAS to be NY-440 and was partially built with an interchange over I-278, but, typical of so many road projects in New York, was abandoned and never built, and now is sorely needed). The drop occurs at the crest of NY-440 as northbound motorists head downhill under the Rossville Ave overpass (where the NYPD sometimes hide to give out tickets to people doing 60 on a highway designed for 70, but that's NYC's idiotic 50 MPH highway limit for you...), just south of Exit 4/Aurthur Kill and Huguenot Ave. Last observed: 10/10/2017. Columbia County, Austerlitz: Heading south on NY-22 from the Masspike/NYS Thruway/I-90, coverage quickly fades a few miles north of Austerlitz, and by the time East Hills Rd. is reached, all T-Mobile calls drop. Additionally, due to AT&T Wireless' poor coverage in the area, even though T-Mobile will allow roaming on AT&T Wireless in the general area, drivers and residents won't have much better luck roaming on AT&T, until south of JCT NY-203 where AT&T's coverage improves somewhat. Last observed: 09/28/2016. Columbia County, Gallatin: T-Mobile calls drop along CTY-7 at the JCT with Tinker Hill Rd. at the Gallatin Town Hall. T-Mobile's coverage is typically poor in the general area, from CTY-3/NY-22 in Boston Corners, west to Ancram, Gallatin, and Silvernails, and only resumes (partially) near the Taconic State Parkway, where it often roams on AT&T Wireless. Most recent instance occurred: 10/08/2016. Dutchess County, Arlington/Freedom Plains: T-Mobile drops calls (as well as data connections) along NY-55 near the JCT with CTY-49/Titusville Rd. The area is equidistant from the Taconic State Parkway and the Poughkeepsie City limits, and one would expect better coverage along N-55, which connects both areas. Needless to say, Verizon, AT&T, and even Sprint have no problem covering the area without any drops or areas of little/no coverage. Most recent instance occurred: 12/01/2016. Dutchess County, Holmes: T-Mobile voice and data calls drop along NY-292, at the JCT with CTY-30, south of Waley Lake (near the Metro North Beacon Line crossing). Calls initiated south of the area (such as long I-84) which transition to County Road 30 will drop in the general area of where it meets NY-292. Last observed: 09/25/2015. Dutchess County, LaGrange (Hamlet of Billings): TMO drops occur on NY-55 east of the Taconic State Parkway just east of the JCT with NY-82. Last observed: 11/03/2014. Dutchess County, Pawling: T-Mobile calls drop due to poor/no overage for over two miles on NY-55's eastern segment east of NY-22, which heads to CT and becomes CT-55. Coverage drops out _completely_ on NY-55 approximately 1 mile east of the JCT NY-22/NY-55, in the general area of the JCT of NY-55/CTY-22 (that's Dutches County-22, it's not a typo, CTY-22 is just east of NY-22 there!) and there is no coverage for over five miles until entering the CT system where NY-55, now CT-55, meets and ends at JCT US-7 in Gaylordsville, CT. Most recent drop occurred: 01/02/2019. Dutchess County, Unionvale/Billings: T-Mobile calls drop along NY-82, just north of the JCT with NY-55, and has poor service for the stretch of NY-82 between the JCT with NY-55 and the JCT with US-44/NY-343 in Millbrook. All carriers (including Verizon) seem to have problems with this section of NY-82, but TMO is by far the worst, with barely any coverage along most of this stretch. This seems to be keeping with their coverage (or lack thereof) plan of "No T-Mobile Coverage north of NY-55" (at least in eastern Dutchess), as generally anywhere one travels north of NY-55, TMO coverage becomes spotty and so "lossy" and "droppy" that it's basicaly unusable in a mobile environment. Most recent drop occurred: 07/16/2016. Dutchess County, Wappingers Falls/Wappinger Lake: T-Mobile calls drop along NY-9D, just south of the JCT with E. Main St, and poor/no coverage continues heading northwards on NY-9D into downtown Wappingers, and further north along NY-9D until the JCT with US-9 (where Staples is located on the SW corner). Effectively, T-Mobile has no coverage to the west of Wappinger Lake along NY-9D, including in the town of Wappingers, and south along NY-9D and CTY-91 for about 1 mile. The entire area is relatively built up, is only a mile or so west of heavily travelled US-9, and just south of the Poughkeepsie Galleria, where T-Mobile/one of TMO's reseller has (had?) a store (or at least a kiosk). Not the best customer retention technique if 5 minutes after leaving the mall a new T-Mobile customer tries to place a call or use data along NY-9D in Wappingers and finds they have little to no useable coverage!. First observed: 12/28/2016. Nassau County, Bayville: T-Mobile drops occur along the legnth of the (small) beach area in Bayville, and suffers poor to no coverage in the parking lot, as well as the dining/amusement area directly south/across of the beach. T-Mobile has such generally poor coverage in the area that it is nearly impossible to place/receive or maintain a call from the Bayville beach area eastwards along Shore Road all the way into Oyster Bay. Last observed: 05/11/2017. Nassau County, Cold Spring Harbor: T-Mobile calls drop 1/4 of a mile west of the JCT with the Cold Spring Harbor Labs access road/traffic light. Heading eastwards "down the hill" towards Cold Spring Harbor and JCT NY-108 (Harbor Rd. ), T-Mobile calls drop just west of the Cold Spring Labs and suffer poor coverage in the general area of NY-25A and NY-108. Verizon has no voice problems in the area (data is not as good), which indicates that a well-planned pattern of coverage can handle even topographically challenging areas, something TMO has not seemed to be able to master in this area (as well as many other areas along NY-25A). Last observed: 12/16/2016. Nassau County, Cold Spring Harbor: The entire stretch of NY-25A, between Flora Street (near the Cold Spring Library) on the west end of town, and Lawrence Hill Rd on the eastern end of town, suffers drops and coverage gaps, which includes the "downtown" area where shops line both sides of NY-25A. Data service is nonexistent (it says "4G" but generally the coverage is poor that T-Mobile's data service is useless downtown), it seems, and either TMO is not letting their customers roam on AT&T Wireless there or the coverage is poorly implemented that phones can't decide which carrier to use; in any case, expect very poor to no coverage while traveling through Cold Spring Harbor on TMO. Further drops and spotty lack of coverage were observed in April 2016 near the Goosehill Elementary School to the north of Northern Blvd/NY-25A congruent with the aforementioned "downtown"/Cold Spring Harbor Village/shops area. Last observed: 12/16/2016. Nassau County, Great Neck: T-Mobile calls drop on the Long Island Railroad's Port Washington Branch between the Great Neck and Little Neck stations, just on the Nassau County side of the line. (Great Neck is in Nassau County, while Little Neck is in Queens County.) Another example of a highly used corridor which experiences drops with T-Mobile while others (such as Verizon) somehow manage to ensure that calls remain connected and that it's technically possible to have drop-free coverage on the same route. Last observed: 09/01/2016. Nassau County, Muttontown/Jericho: T-Mobile drops calls along NY-106/Jericho-Oyster Bay Rd., just south of the JCT with NY-25A/Northern Blvd. Active T-Mobile calls which are initiated in the Jericho/Hicksville Area (such as at the Whole Foods) will drop traveling north along NY-106 aproximately 2 miles south of the JCT with NY-25A, while heading south, calls whivh are active along NY-106 in Oyster Bay (for example, near the Hess station) will start to attenuate south of NY-25A and completely drop after two miles south of NY-25A. Last observed: 05/11/2017. Nassau County, Plainview: TMO calls drop on the Northern State Parkway just east of the South Oyster Bay Rd. interchange. Last observed: 01/05/2015. Nassau County, Roslyn: Barely any useful T-Mobile service (voice or data) in the harbor/old Rosyln Village section (ie, the part bypassed by the NY-25A Roslyn Viaduct). It was recently impossible to make or receive calls from many areas of the village along "old" NY-25A, and data never came in south of the NY-25A viaduct. This lack of coverage in what is generally a well-travelled and generally popular destination with rows of restaurants and shops -in the middle of a heavily populated area- is typical of the coverage issues which T-Mobile has (which are rarely found with other carrier and clearly not problems in Rosyln and similar areas with Verizon Wireless and AT&T Wireless). Last observed: 07/25/2016. Orange County, Slate Hill: T-Mobile calls drop along I-84 at Mile Marker 12, in the town of Slate Hill. T-Mobile has a series of drops and spots of poor coverage between MM12 and MM8 or so, resulting in frequent drops and poor/distorted audio in the area. Last observed: 01/02/2019. Orange County, Wallkill: T-Mobile calls drop along I-84 in the Village of Wallkill, approximately at Mile Marker 27.2, near I-84's crossing of the Wallkill River. Last observed: 01/02/2019. Putnam County, Town of Southeast, Brewster: T-Mobile calls drop at the I-84 transition to I-684; calls initiated in Connecticut along I-84 (such as in Danbury) will drop as they transition from I-84W to I-684S. Last observed: 03/17/2019. Putnam County, Peekskill Hollow: Drops occur on the Taconic State Parkway nearly halfway between Bryant Pond Rd and the next exit northbound, Peekskill Hollow Rd. (Occurs in both the northbound and southbound directions at different locations; NB while descending into Peeksill Hollow, and SB after emerging from Peekskill Hollow prior to the Bryant Pond Road overpass). Last observed: 04/14/2019. Putnam County, Peekskill Hollow: T-Mobile calls drop along Peekskill Hollow Road in numerous locations, and in general, T-Mobile's coverage suffers from long stretches of no service at all. Calls initiated on/near the Taconic State Parkway and which then transition/exit to Peekskill Hollow Rd. northbound will drop multiple times and experience extensive no coverage areas between the Taconic and NY-301. Thus, a call initiated on the Taconic where there is coverage at the northbound/donwhill section of Peekskill Hollow (where there is stone masonry alongside the slow lane), won't get very far no matter where the callers travels: continuing north on the Taconic the call will drop withn 1 to 2 miles, exiting on Peekskill Hollow road and heading south the call will drop almost immediately, and existing on Peekskill Hollow Rd. and heading north (towards NY-301) the call will drop within 2 miles. Last observed: 04/14/2019. Putnam County, Philipstown/Cold Spring: T-Mobile calls drop (voice and data) along NY-301, approximately 3 miles west of the JCT with US-9. (Sprint drops/has no coverage as well; Verizon/AT&T maintain calls along NH-301.) Last observed: 09/26/2017. Rensselear County, Haynersville/Brunswick Town: T-Mobile calls drop along NY-7/Hoosick Rd, near the JCT with Mickelhill Road. Heading east along NY-7 from the JCT with Mickelhill Rd, T-Mobile has no coverage until Bennington, VT(! ), and does not appear to allow T-Mobile customers (even post-pay) to roam on AT&T, making the TMO phone generally useless east of Haynersville all the way across southern Vermont to I-91 in Brattleboro. Last observed: 10/04/2016. Rockland County, Bear Mountain State Park and Bridge/Palisades Parkway: There is poor to no T-Mobile coverage on the Palisades Interstate Parkway between Exit 16 and Exit 19 (near the Bear Mountain Bridge). There is also little to NO TMO Wireless coverage between the Bear Mountain Bridge Rotary westwards to the Palisades/US-6 West rotary, along which T-Mobile calls drop. There is very poor to no coverage south of the Palisades rest-area/Welcome Center, and the area of poor coverage extends for over 6 miles south to New City, again, typical of T-Mobile's poor and spotty coverage outside of urban NYC. Most recent instance occurred on 08/01/2018. Rockland County, Suffren/Airmont: T-Mobile calls drop along I-287/I-87 at Exit 14B/CTY-89/South Airmont Rd. Most recent instance occurred on 08/01/2018. Suffolk County, Amityville: T-Mobile calls drop on the Southern State Parkway just east of Exit32/NY-110. Data sessions also drop (or hang the session) and applications passing data (such as SSH, Telnet, streaming audio and/or video, etc) require a restart. Last observed; 02/25/2015. Suffolk County, Baiting Hollow/Wildwood: T-Mobile calls disconnect along Sound Ave (old NY-25A) near the JCT of Osborne Road (as NY-25A heads into a little "hollow" where it goes down, has a few curves, and emerges from the hollow 1/4 of a mile later. Calls begin to deteriorate entering the "hollow", and will drop before returning to the normal plane of the road in either direction. As this area of the western North Fork (NE of Riverhead) is relatively flat and not too challenging to cover, TMO has generally acceptable coverage in the area, but on this main road (Sound Ave), which is used as a bypass around Riverhead to get to areas further east, where every other carrier manages to hold the connection, T-Mobile still suffers a drop there. Last observed: 02/27/2016. Suffolk County, Bayport: T-Mobile calls drop on NY-27A just west of the JCT with CTY-97/Nichols Road. Data coverage also drops. Further west along old NY-27A, data coverage is very poor and will only run at 2G speeds. Overall, very poor coverage along old NY-27A, a verh heavily traveled road. Last observed: 03/03/2015. Suffolk County, Centerport: TMobile calls drop and generally have poor coverage along NY-25 at the JCT with Centerport Road (to the south)/Little Neck Rd (heading north), in the general area of the Mill Pond House in Centerport. This is one in a chain of many drops along NY-25 in eastern Nassau/Western Suffolk where T-Mobile drops calls and has poor/no coverage along NY-25A, generally where NY-25A drops towards the ocean or enters into some cove along the north shore. Needless to say, Verizon has no drops along the entirety of this stretch. Last observed: 12/18/2016. Suffolk County, Farmingville: T-Mobile drops calls along the Long Island Expressway (LIE/I-495) generally near exit 63 (CTY-83/North Ocean Ave) in Famingville. Last observed: 06/23/2016. Suffolk County, Fort Salonga (Northport): T-Mobile calls drop (but voice and data) along NY-25A at the JCT of Bread and Cheese Hollow Road, just west of Sunken Meadow/Afred E. Smith State Park. There is pretty much no coverage at all in the area, and coverage does not resume until the Sunken Meadon Parkway (heading east) or Noorwod Rd. in downtown Northport. This is one in a chain of many drops along NY-25 in eastern Nassau/Western Suffolk where T-Mobile drops calls and has poor/no coverage along NY-25A, generally where NY-25A drops towards the ocean or enters into some cove along the north shore. Needless to say, Verizon has no drops along the entirety of this stretch. Last observed: 12/18/2016. Suffolk County, Kings Park: TMobile calls drop on NY-25A at the intersection with Sunken Meadow Rd., approximately 1/2 mile west of the JCT with the Sunken Meadow Parkway. Traveling eastward from this drop, TMO service doesn't resume until approximately 1/2 mile east of the Sunken Meadow Parkway, possibly because of TMO's apparent difficulty in re-acquiring signal after a call drops (as we have seen in other areas as well). Last observed: 01/06/2015. Suffolk County, Mt. Sinai: T-Mobile drops calls along Mt. Sinai-Coram Road, at the JCT with North Country Road (likely an old alignment of NY-25A, as it is along other stretches of the North Shore as well). Calls drop in both directions (heading northwest to Mt. Sinai or southeast to NY-25A). Part of a series of drops and an area of generally poor coverage north of NY-25A along North Country Rd, from just east of downtown Port Jefferson, all the way along North Country (or other primarily E/W roads along the North Shore) to Miller Place (near the firehouse), where North Country then heads east/southeast to rejoin the current NY-25A. Note this isn't unique to TMO; all the other carriers (including, surprisingly, Verizon) have poor coverage and multiple drops from Mt. Sinai to Miller Place as well. Most recent instance: 11/02/2017. Suffolk County, Northport: T-Mobile calls drops along NY-25 in the area between/delimited by Sandy Hollow Road (to the west) and Woodbine Ave (to the east) in Northport. This is one in a chain of many drops along NY-25 in eastern Nassau/Western Suffolk where T-Mobile drops calls and has poor/no coverage along NY-25A, generally where NY-25A drops towards the ocean or enters into some cove along the north shore. Needless to say, Verizon has no drops along the entirety of this stretch. Last observed: 12/18/2016. Ulster County, Esopus: T-Mobile calls drop along US-9W, just north of the town of Esopus, at the JCT with Ulster CTY-16. T-Mobile has generally poor coverage along US-9W in the Esopus area, and a number of drops take place along US-9W from south of Esopus all the way north to Kingston. Typically, compared to nearly everyone else (Verizon, ATT, Sprint, which seem to manage coverage in the area relatively well, especially Verizon, of course), TMO simply can't seem to get its act together (of course) and just drops along one of the major roads paralleling the west shore of the Hudson which is likely the main road/first choice for local traffic. Last observed: 07/16/2016. Westchester County, Briarcliff Manor: T-Mobile calls drop on the Taconic State Parkway at Mile Marker 10.2, approx 2 miles north of the JCT with NY-100/NY-133/"Ossining" exit. Last occurred: 02/20/2017. Westchester County, Eastchester: T-Mobile drops calls on the Hutchinson River Parkway near the Mill Road (southbound) / North Avenue (northbound) exits, heading in both the northbound and southbound directions. Last occurred: 03/17/2019. Westchester County, Eastchester: T-Mobile calls drop on the Hutchinson River Parkway in the southbound direction near the Hutch/Cross County Parkway split. Last occurred: 01/12/2019. Westchester County, Ossining: TMO drops occur at or near the Taconic State Parkway's JCT with NY-134, north of the Millwood exit. This may be coincident with the Briarcliff Manor drop (see above) and related manifestations in slightly different areas of the same underlying coverage issues which vary based on time of day, traffic, topography, and weather. (AT&T, Sprint, and Verizon do not drop in the same area.) Last occurred: 04/14/2019. Westchester County, Peekskill: T-Mobile calls drop on Highland Ave / US-202 / US-6 / "The Goat Path" between the US-9 rotary and the Bear Mountain Bridge, or more specifically, about 1/2 mile south of the overlook/rest area. T-Mobile has very poor to non-existent service most of the US-202/US-6 from the US-9 rotary to the Bear Mountain Bridge, so drops with TMO along the route are to be expected, typical of TMO. Most recently observed on: 08/01/2018. Westchester County, Purchase: T-Mobile calls drop on I-684 near the Anderson Hill Road overpass near Westchester County Airport/NY-120A. Additional drops also occur further south near the 65/55 MPH speed limit change, about 2 miles south of the Westco airport exit. This is another area where Verizon/ATT used to have problems and similar drops, but they were corrected nearly 10 years ago, why can't T-Mobile address these as well? As of 2019, coverage will barely hold most of the time, although the audio drops out and can be distorted; this may be a seasonal result of bare trees in winter lacking leaves (with water) to interfere with RF signals. Last occurred: 07/24/2018. Bucks County, Bristol: T-Mobile drops calls along I-95/Delaware Expressway at the JCT with the extensive on/off ramps for PA-413. (The PA-413 high-speed ramps where built in the 1990s and intended as a future connection to I-276/PA Turnpike Extensionn. It was later decided that the geometry of the interchange was unsuitable, and a newer interchange is currently (2017) being built to connect the PA Turnpike directly with I-95 slightly north of the PA-413 ramps. This would of course not have been as necessary had the NJ towns along the never-built I-95 segment in NJ (the only segment which, even as of 2017, is still not finished for I-95 for its entire legnth!) realized in the 1980's that having I-95 pass away from Princeton, et. al., was better than having US-1 and US-206 become the de-facto I-95 route through the area, but no, they steadfastly opposed I-95's completion as a free road and only now that US-1 has been widened to 8 lanes, and US-206 is jammed and will soon have to be widened as well, do they see the foolisheness of their ways with the excessive local traffic in the area and have no remedy as I-95 has been moved over to the NJ Turnpike, which will connect with the current I-95 segment in Pennsylvania just north of the PA-413 interchange. In any case, T-Mobile can't seem to cover this too well (perhaps they're waiting for I-95 to be properly built through NJ before they improve coverage on the PA side? :) ), and calls drop between the I-276/PA Turnpike overpass and the PA-413 ramps (between which I-95/I-276 connection is being built, probably for the same amount it would have cost to build the entirety of I-95 in NJ in the 1980s!). Last observed: 03/02/2017. Bucks County, Yardley: T-Mobile drops calls along southbound I-95, just after the Scudders Falls Bridge over the Delaware River (thus, at the NJ/PA state line), slightly south of the soutbound I-95 rest area. Calls placed at the I-95 Rest Area will deteriorate shortly after leaving it, and within a mile or two further south along I-95, calls drop completely. This may be part of the above "Bristol" drop and/or generally (and typically) poor coverage on the part of T-Mobile. Last observed: 01/28/2018. Chester County, Concordville: T-Mobile calls drop along US-322 at Creek Parkway. Calls initiated along US-1 heading south along US-322, or from I-95 northwards, will drop within 1/2 a mile in either direction after passing Creek Parkway. Last observed: 11/22/2015. Chester County, Nottingham: T-Mobile calls drop along US-1 at the Pennsylvania/Marlyand Line (north of Rising Sun, MD), near the JCT with Ridge Road. All other carriers tested no longer drop in the area (Verizon used to pick up a bit of the 00096/Harrisburg system there which sometimes led to drops, but this was fixed around 2010). Last observed 05/01/201611~. Chester County, Toughkenamon: T-Mobile calls drop along US-1 at Mile Marker 17.5, or just a bit south of the JCT/interchange with Newark Rd. Just another one of the seemingly many T-Mobile drops along the US-1 freeway from the Maryland line to Kennet Square. Last observed: 03/10/2019. Lancaster County, Ephrata: T-Mobile drops calls on US-222, at the JCT with US-322, in Ephrata. This is a few miles south of the JCT with the PA Turnpike/I-76, and along a relatively flat, unchallenging land topography; Sprint drops here as well, but AT&T and Verizon do not. Last observed: 01/20/2018. Lebanon County, Lebanon: T-Mobile calls drop along I-81 in the general vicinity of mile marker 90, approximately 2 miles north of the JCT with I-78 (which is also where I-78 ends). Last observed: 09/01/2015. Lehigh County, Bethlehem: T-Mobile calls drop on PA-33 approximately 3/4 of a mile north of the JCT with I-78 (this is on the 'new' section of PA-33 which was finally built when I-78 was re-routed off of US-22 and built as a more southerly route around Allentow/Bethlehem). Last observed: 01/20/2018. Luzerne County, Bloomsburg/St. Johns: T-Mobile calls drop along I-81 at the JCT with I-80/exits 151A and B. Heading southward, calls drop on the downhill along I-81, and by the time I-80 is crossed from above, TMO calls become too distorted and atennuated to hear the called/calling party, and calls drop shortly thereafter near the I-80E to I-81S transtion on-ramp. Heading northwards, calls begin to attenuate near the JCT with I-80, and by the time the I-80 transition/merge lanes end nortbound, TMO calls drop completely. Last observed: 09/16/2016. Luzerne County, Nanticoke/Mountain Top: T-Mobile drops calls on I-81 at Exit/Mile Marker 164/JCT PA-29/S. Cross Valley Expressway (just south of the separate PA-309 JCT with I-81). Calls drop in both directions (N/S), generally between the JCTs with PA-29 and PA-309. Last observed: 09/16/2016. Luzerne County, Nuangola: TMO calls drop along I-81 in the vicinity of Mile Marker 161, 1.5 miles north of exit (mile marker) 159. Part of a continuous series of drops along I-81 as compared to Verizon which does not drop at all along the same section(s) of road. T-Mobile is effectively useless for longer-duration calls in this area as the constant drops make conversation difficult to impossible. Last observed: 09/01/2015. Luzerne County, Wilkes-Barre: T-Mobile calls drop on I-81 at Mile Marker 173, between the PA Turnpike Extention (I-476) and PA-309. Last observed: 09/01/2015. Monroe County, Stroudsburg: T-Mobile calls drop along the US-209/PA-33 freeway, just south of the merge between PA-33 (which connects to I-80 to the west), and US-209, (which connects to I-80 to the east), forming a "Y". Calls drop at the "base" of the "Y", after PA-33 and US-209 merge, heading southbound. No other carrier drops along PA-33/US-209 in this area. Last observed: 01/20/2018. Northampton County, Wind Gap: T-Mobile drops calls along PA-33 (along the "old section" north of US-22), between the two PA-512 JCTs. (PA-512, North Broadway and South Broadway, is effectively "Business PA-33". T-Mobile calls also drop along PA-512 near the Arby's, closer to the southern PA-512/PA-33 JCT.) Calls do not drop on any other carrier along PA-33 or PA-512 between the two Wind Gap exists. Last observed: 01/20/2018. Philadelphia City and County: T-Mobile calls disconnect along I-95 near the Eagles sports complex; southbound calls begin to deteriorate as I-95 passes under the partial interchange with I-76/Walt Whitman Bridge, and will completely disconnect and drop passing the Eagles/Phillies sports complex area near Exit 17/PA-611. No other carrier experiences these problems on such a heavily traveled road. Last observed: 09/17/2016. Philadelphia City and County, North Philadelphia: T-Mobile drops calls along I-95, in the general vicinity of Girard Ave., just north of I-676/Vine Expressway. Last observed: 12/18/2016. Philadelphia City and County/North Philadelphia: T-Mobile calls drop along I-95/Delaware Expressway in the general area of JCT PA-73/Cottman Ave, just north of where PA-73 breaks way from I-95 and heads over the Tacony-Palmyra Bridge heading to New Jersey. Really? TMO can't even hold a signal along I-95 in Philadelphia? Verizon can manage I-95 from Maine to Virginia without a drop, why can't TMO manage a few miles north of Philly? Last observed: 12/18/2016. Philadelphia City and County/South Philadelphia: T-Mobile calls drop/disconnect along I-95 in the general vicinity of the Philadelphia International Airport, near the high-speed ramps to PA-291/Industrial Highway. Last observed 08/23/2016. Pike County, Blooming Grove: T-Mobile drops calls on I-84 at Mile Marker 30.6/JCT PA-402/Exit 30. Part of an area of generally poor and unusable coverage along I-84. Last observed: 01/02/2019. Pike County, Lord's Valley: T-Mobile calls drop on I-84 at the JCT PA-739/Dingman's Turnpike (which leads to Dingman's Ferry), near Mile Marker 34. Also part of the retinue of drops and areas of poor coverage which T-Mobile customers suffer along I-84 in the NE PA area. Last observed: 01/02/2019. Pike County, Matamoras: T-Mobile calls drop along I-84 west of Matamoras, as I-84 leaves the Matamoras/Port Jervis area and ascends a hill as it heads west to Scranton. Calls placed in Port Jervis will drop at Mile Marker 47, and then again at 46, and then again at 44, making it nearly unusable on that stretch of road, until the JCT with PA-739 (to Dingman's Ferry and NJ) is reached, where coverage becomes somewhat better. Last observed: 01/02/2019. Pike County, Milford: T-Mobile drops calls along US-209 just south ogf Milford, entering the Delaware Water Gap National Recreation Area. Calls drop suddently passing the northern park barrier along US-209; all other carriers continue to maintain a good connection (but all do drop somewhere in the park; ATT has the fewest drops, T-Mobile the most, with Verizon and Sprint in-between; T-Mobile, however, has basically no coverage of any use along most if not all of US-209, where coverage does not resume until just south of the park's southern entry gate, at the Turkey Hill gas station area, and thus is the worst of the all the carriers there). Last observed: 01/20/2018. Pike County, Promised Land (State Park)/Blooming Grove: TMO calls drop along I-84 between JCT PA-390 (Mile Marker/Exit 26) and just east of JCT PA-507/Lake Wallenpaupack Rd. Heading westwards, T-Mobile calls begin to degrade after exit 26/PA-390, and drop by Mile Marker 22. Heading eastwards, TMO calls degrade just east of Exit 22/PA-507, and drop just east of MM22. There is no T-Mobile coverage (or barely any) for a mile or so between MM22 and MM23.5, which likely accounts for the drop. Last observed: 09/16/2016. Schuykill County, Donaldson/Good Spring/Tremont: T-Mobile drops calls on I-81 at or about Mile Market 109, near the apex/crest of a hill between exit 107/US-209 and exit 112/PA-25/E. Main St. I-81 makes a significant curve to navigate the terrain in the area, and TMO drops calls just at about the center point of the "curve" on I-81. Last observed: 09/16/2016. Schuylkill County, Hecksherville: T-Mobile calls drop along I-81 at Mile Marker 121.5, just north of the Highridge Park Road exit. Last observed: 09/01/2015. Schuylkill County, New Boston-Morea: T-Mobile calls drop while traveling on I-81 at Mile Marker 128, about halfway between exit 124/Frackville/St. Clair/PA-61 and exit 131/Vulcan Hill Rd. Last observed: 09/16/2016. Schuylkill County, Ravine: T-Mobile calls drop along I-81 at Mile Marker 103.5, just south of the Ravine exit (104) for Molleystown Rd. Last observed: 09/16/2016. Windham County, Guilford: Drops occur at Mile Marker 4.2 just south of the Vermont Welcome Center (with the moose to the right of the building's main doorway, or at least there used to be a moose there, it seems to be missing now in 2015!). As per the Massachusetts section, there is a drop heading north near the VT/MA border (which Verizon and AT&T fixed years ago, while lower tiered carriers like Sprint and TMO seem to allow the drop to continue), thus T-Mobile will only cover around 4.2 miles before it drops again!. There is so-so coverage at the rest area, but TMO does allow roaming on AT&T Wireless there, so often times it is the AT&T signal being received (which does hand off to the Mass system and will be rough but will not generally drop from Greenfield, Mass to Brattleboro, VT. Essentially, don't expect to make too many calls on T-Mobile once you get north of Greenfield, MA and head into Vermont! -- typical of how T-Mobile is really only viable for general use in urban areas or inter-urban (highway) corridors. Last observed: 10/01/2016. Independent City of Alexandria, Old Town: T-Mobile calls (more often data than voice) drop along the George Washington Memorial Parkway as it transitions from a limited access parkway to North Washington Street in Old Town. Heading southbound, after crossing the railroad tracks/spur line leading to the Potmac Yards, TMO calls begin to deteriorate, and by the time First Street is reached, calls drop completely. Last observed: 10/05/2015. Independent City of Alexandria, Old Town/Belle View: T-Mobile calls atennuate and become difficult to hear/understand spoken words on the G.W. Parkway/VA-400 just south of Old Town before the JCTs with Belle View Blvd. Calls will drop 50% of the time exiting from the SB GW Parkway heading west on Belle View Blvd. near the 24-Hour Safeway. Last observed: 02/19/2016. Independent City of Manassas (contained in Prince William County): T-Mobile calls drop along I-66, between JCT VA-28 (which hopefully, one day, will become part of the Outer Beltway with a TOLL-FREE bridge to Maryland...in about a million years...) and JCT VA-234 North. Generally, heading westbound on I-66, T-Mobile calls drop just east of the Rest Area, which itself is about a mile or so east of JCT VA-234N. (VA-234 is multiplexed with I-66 between JCT VA-234N and the VA-234 freeway segment a few miles to the west; these should be connected north of I-66 so VA-234 traffic doesn't have to merge with I-66 traffic; better yet, make VA-234 the Outer Beltway!). Eastbound, calls initiated in Manassas or along I-66 west of Manassas will drop prior to JCT VA-28. At times, T-Mobile calls will transitio to VA-28 north, but will attenuate near the traffic light (yes, a traffic light! Is it really too hard to have a full interchange between VA-28 and I-66???!) just north of I-66 and drop passing the remnants of the E/SE connection to Backlick Road (which I-66 bisected and made non-contiguous). Last observed: 09/28/2017. Arlington County, East Falls Church: T-Mobile calls (and data sessions) drop in the vicinity of, and while driving along, Washington Blvd and the East Falls Church Metro Station. The same drops often occurs along I-66 which parallels Washington Blvd in the area. (It is likely, but untested, that T-Mobile calls will also drop on Metro's Orange and Silver lines in the same area, as they are above ground in the median of I-66 and thus traverse the same coverage problem area which I-66 and Washington Blvd do. Last observed: 10/20/2015. Arlington County, East Falls Church: TMobile calls/data sessions drop along I-66 slightly east of the N. Ohio St. overpass, at Mile Mark 70, east of the East Falls Church Metro station (near where all the trees along the inbound/eastbound Orange/Silver line line run between Metro and eastbound I-66). This drop is likely associated with the above drop along Washington Blvd, and appears to be a systemic problem with T-Mobile, typical of cellular coverage in the mid-1990s rather than a modern, well-tested service area. Besides the hugh volumes of traffic on I-66 and on WMATA's Orange and Silver lines, the area is a densly-populated, high-income DC suburb, and if T-Mobile can't even cover Arlington without drops, it speaks volumes as to how they handle less well-travelled/populated areas. (Verizon and Sprint don't drop here in this area). Last observed: 11/20/2015. Fairfax County, McLean: TMO Calls drop on the GW Memorial Parkway near JCT VA-123/Dolly Madison Blvd./Chain Bridge Rd. Last observed: 11/04/2014. Fairfax County, McLean: T-Mobile calls drop along VA-123/Dolly Madison Blvd near the JCT via VA-193/Georgetown Pike. Calls initiated in downtown McClean will drop at or near the VA-193 when driving east on VA-123. In conjunction with the above drop on the GW Parkway, calls initiated on the Chain Bridge Rd. section on VA-123 (east of the GW Parkway) will drop just west of the GW Parkway, between Kirby Rd. and VA-193/Georgetown Pike. Last observed: 05/01/2017. Fairfax County, McLean/Tysons: T-Mobile data calls drop (occasionally voice but we haven't had too many drops voice-wise here) along the DC Beltway/I-495 at the overpass over Old Dominion Rd/VA-738, mainly in the northbound direction. Last observed: 06/30/2016. Washington DC Metro, L'Enfant: Calls drop south of L'Enfant Plaza on the Yellow Line as it breaks away from the Green Line towards the dedicated Yellow Line bridge crossing the Potomac River. Calls tend to drop shortly after the switch track area where the Yellow Line heads southwest in the tunnel prior to emerging to the open air segment leading to the bridge. (All carriers are affected by this drop; there are many, many more drops, practically between every underground station on T-Mobile; Verizon has the fewest and can actually hold a connection between stations as they used to when they were analog). Last observed: 11/05/2014. Washington DC Metro, Gallery Place: Pretty much unusable T-Mobile coverage for both voice and data on the lower level (Yellow and Green line) platforms of the Gallery Place station (a major transfer point in the Metrorail system). Depending on where a call is initiated on the lower level platform, it will either take a long time to set up or just fail outright. Data service indicates "2G" and can barely pass and data at all. Update as of Sept 1st, 2016: Voice works acceptably on the upper (Red Line) platform, at least closer to the western mezzanine (heading towards Metro Center), but data is more or less useless. In areas where voice calls are passable, data sessions are difficult to impossible to initiate or maintain. Last observed: 09/02/2016. Morgan County, Berkeley Springs: There is very poor T-Mobile coverage on WV-9 east of Berkeley Springs, and no coverage driving west to Paw Paw. Coverage should be better as this location as it is just south of I-68, but then again this is T-Mobile, which doesn't seem to believe in rural coverage, at least not in this part of the country. Last occurred 09/17/2014. The following were problem drop areas but have apparently been corrected and/or no longer suffer from regular/repeated drops. Fairfield County, Stamford: T-Mobile drops occur on I-95 north of Stamford over the tracks to the New Canaan Branch. The drop appears to have been resolved as of August 2014. New York County (Manhattan): There is no T-Mobile coverage in the Park Ave tunnel north of Grand Central. It is unclear is roaming is available of AT&T Wireless, which does cover Grand Central Station as well as the Park Ave tunnel between GCT and the above-ground section near 100th St. Most recent instance occurred on 11/21/2014, corrected as of 2018. Westchester County, Bedford: TMobile calls (voice and data) drop along I-684 within a few miles either way of the JCT with NY-172. Last occurred: 02/20/2017, corrected (it appears) as of January, 2019. Westchester County, Purchase: T-Mobile calls drop on the Hutchinson River Parkway, a few miles south of the CT border and 1/2 mile north of the JCT with I-684, in the general area of the Purchase exit. Last occurred: 11/29/2014, corrected as of late 2018. 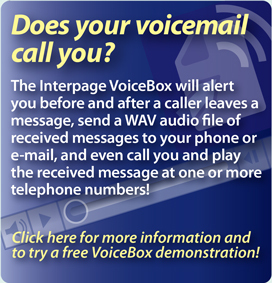 E-Mail: Please mail to abcwireless-notes@interpage.net , removing the first three letters of the alphabet from the name/address. Phone: +1 (802) 316-5000 M-F, during regular business hours.